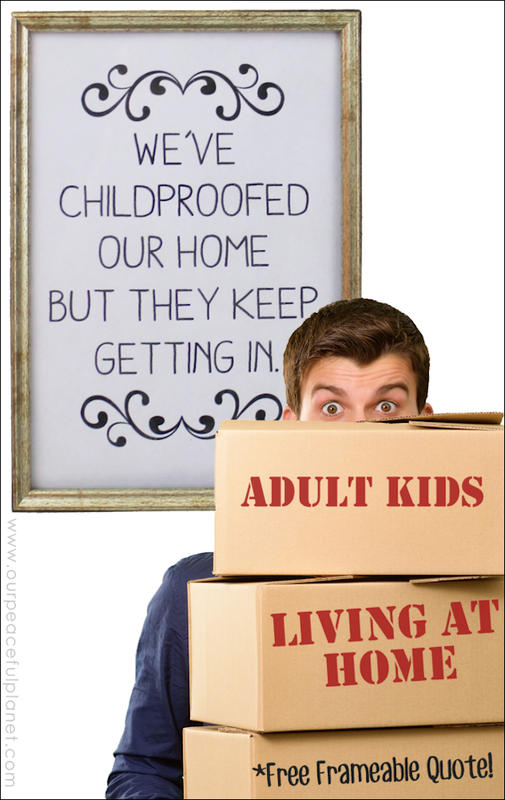 If you’ve got adult children living at home, you’re not alone. In fact, almost 40% of adult children do. (1) There are a lot of reasons for this: economy, saving for school etc. But the fact is many adult kids are moving back home so we might as well make the best of it. We’ve had our children live with us at various times after adulthood and in all honesty we were happy to do it. But there are certain inherent issues that can crop up with the situation. So we’ve got a few pointers to help save your sanity and keep your relationship intact. For more tips on relationships read How To Diffuse an Argument. You can also get our free high resolution frame-able quote at the bottom of the post. It comes in two sizes. 5″x7″ and 8″x10″. Such timely advice, our 21 year old daughter is just finishing uni and moving back home for a “while” whilst she sorts herself out job wise. I’m looking forward to having her around more for a bit but I think we are all going to need some adjustments as she’s been away (apart form holidays) for 3 years! So glad you found it helpful. If she finished college that means she’s already incredibly responsible. Enjoy having her back for a while and thanks for the lovely comment Julie. Next: Yard Sale Kit & Tips : Declutter & Profit!